/FT MIM Fender "metal tele"
Discussion in 'Guitars For Sale / Trade / Wanted' started by Kendalllikevines, Jun 17, 2013. White with all black hardware (except for chrome string ferrules and chrome/black Schaller locking tuners) and black pickguard Flamed maple neck. Comes with Dimarzio crunch lab/Liquifire pickups. Looking for an Ibanez rga121 or other MIJ Ibanezes, but feel free to throw me some offers. No LTD or Schecter. I'll add cash for the right deal. As for price I'm looking at 500 shipped. I'll post pics later. Sorry for the poor quality pictures. I'll take some HD ones soon. Modifications (if any):all black hardware (except for chrome string ferrules and chrome/black Schaller locking tuners) and black pickguard Comes with Dimarzio crunch lab/Liquifire pickups. Looking for an Ibanez rga121 or other MIJ Ibanezes, but feel free to throw me some offers. No LTD or Schecter. I'll add cash for the right deal. Fixed the links. Free bump! http://www.sevenstring.org/forum/gu...z-rg1527z-rb-w-evo-tone-zone.html#post3596496 + cash on your end? 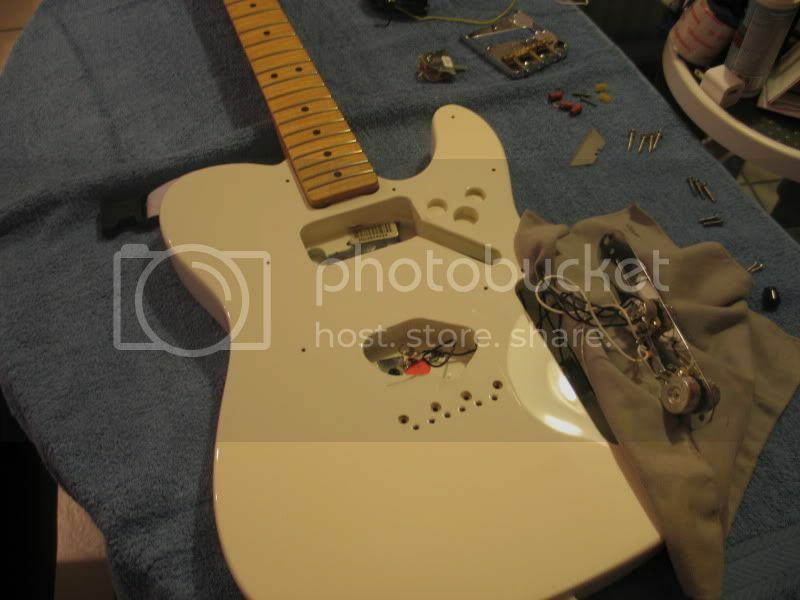 Did you have to do any major modifications to make that bridge and bridge humbucker work on a MIM tele? I did not. This tele came stock with a HH configuration. Shoot me cash offers. are you solid on the no schecter rule? Not trying to hurt your sale, but I was the original owner of this guitar and it was a Standard single coil Tele. And it didn't have a neck pickup when it left me....just saying that was routed and put in afterwards. For whoever asked everything went together just fine, no issues for how it was when I traded it away. The neck originally was routed for a humbucker the bridge was not. Here is this guitar back in the day when I got it. Ah yes I forgot about that, however it still didn't have a neck pup in it when I sent it to him, it only had a single hum pickguard. That is a slick looking guitar. Can you take a better shot of the neck? It looks like it has a nice flame. Still available? Interested in an Agile Intrepid 8 string with Hardshell case?? No 8 strings. Will consider 7 strings. Especially mij 7421/7621s. I'll add cash for the right deal. Also love MIJ 6 string ibbys. Will add cash. If ANYONE has an RGD2120z they want to get rid of, that'll be optimal. Still available. Shoot me offers. Willing to add cash for the right MIJ Ibby. Offer me anything. The worst I can say is no.